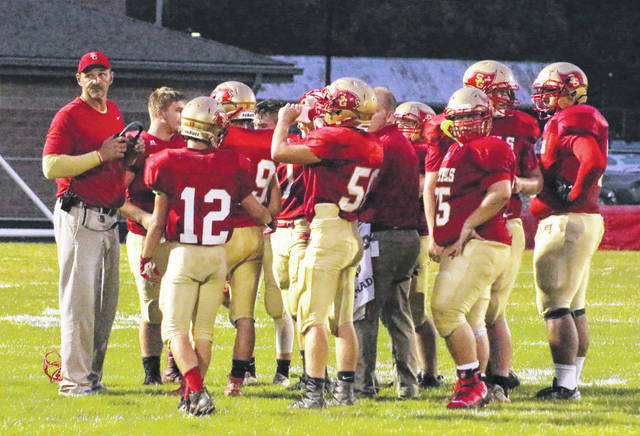 South Gallia football coach Mike Smith, left, checks the scoreboard before talking with his troops during a timeout in a 2017 Week 4 contest against Manchester in Mercerville, Ohio. Last Week: River Valley lost to Coal Grove 47-0, in Bidwell; Gallia Academy defeated Meigs 47-34, in Gallipolis. Last meeting between the teams: September 2, 2017. Gallia Academy won 49-7, in Bidwell. Current head-to-head streak: Gallia Academy has won 1 straight. RVHS offense last week: 113 rushing yards, 56 passing yards. GAHS offense last week: 335 rushing yards, 155 passing yards. RVHS offensive leaders last week: QB Braden Kemper 3-of-7, 56 yards, 2INTs; RB Layne Fitch 7 carries, 51 yards; WR Jared Reese 2 receptions, 42 yards. GAHS offensive leaders last week: QB Justin McClelland 5-of-7, 155 yards, 2TDs, 1INT; RB Lane Pullins 26 carries, 129 yards, 2TDs; WR James Armstrong 4 receptions, 155 yards, 2TDs. RVHS defense last week: 265 rushing yards, 95 passing yards. GAHS defense last week: 86 rushing yards, 240 passing yards. 1. This is the 14th gridiron meeting between GAHS and RVHS, with the Blue Devils holding a 10-3 record. In the 13 previous games, GAHS holds a 467-to-117 scoring edge. This is the fourth annual OVB Community Bowl, with Gallia Academy in current possession of the traveling trophy. 2. River Valley’s last trip to Memorial Field was on Sept. 3, 2016, and resulted in a 20-7 Raiders win. Gallia Academy has won four of its last five home games, with Coal Grove as the lone team to win on Memorial field in that span. 3. Last week, the Blue Devils trailed by one headed into the final quarter, but scored 14-unanswered points. Gallia Academy’s 490 yards of total offense bettered all except for one of its 2017 performances. 4. The Raiders held Coal Grove off for over 10 minutes to start last week’s game. CGHS gained 6.3 yards per carry and won the turnover battle by a 3-to-1 tally. 5. In Week 1 clashes, the Ohio Valley Conference was 2-0 against Tri-Valley Conference Ohio Division teams. In addition to this game, Fairland plays Athens, and Chesapeake plays Alexander in Week 2 OVC vs. TVC matchups. Last Week: Waterford defeated East 55-0, in Waterford; South Gallia lost to Symmes Valley 14-12, in Willow Wood. Last meeting between the teams: Oct. 6, 2017. Waterford won 56-8, in Waterford. Current head-to-head streak: Waterford has won 2 straight. WHS offense last week: 308 rushing yards, 94 passing yards. SGHS offense last week: 301 rushing yards, 50 passing yards. WHS offensive leaders last week: QB Peyten Stephens 4-of-5, 94 yards, 2TDs; RB Braden Bellville 13 carries, 158 yards, 3TDs; WR Zane Heiss 2 receptions, 48 yards, 2TDs. SGHS offensive leaders last week: QB Tristan Saber 7-of-19, 50 yards; RB Kyle Northup 17 carries, 121 yards 1TD; WR Jeffrey Sheets 3 receptions, 30 yards. WHS defense last week: 49 rushing yards, 0 passing yards. SGHS defense last week: 57 rushing yards, 38 passing yards. 1. Waterford’s last trip to Mercerville was on Oct. 7, 2016. The Wildcats won that game by a 54-8, ending a five-game skid to SGHS. 2. The Rebels are the first TVC Hocking Division team to test the back-to-back champions this season. Waterford has won 16 straight league games, with Belpre being the last team to defeat WHS, doing so in the 2015 finale. 3. The Rebel defense was on full display last week, holding Symmes Valley to just 2.97 yards per play, while forcing five turnovers. SGHS was plagued by 15 penalties for 120 yards. 4. Last week, the Wildcats avenged their 2017 postseason loss to East in grand fashion, holding the Tartans to four first downs. SGHS also held Symmes Valley to just four first downs. Both SGHS and WHS lost a pair of fumbles in their Week 1 games. 5. Waterford returns five all-league performers from last season in Braden Bellville, Peyten Stephens, Colin Jackson, Brock Hayes, George Pantleidis. Bellville was the 2017 TVC Hocking Offensive Player of the Year. Kyle Northup, Jacob Birtcher and Chad Bostic are all-league performers returning for the Rebels.